Palestine did not require such laborious artificial irrigation as Egypt; Yhwh supplied it with, "water of the rain of heaven" (Deut. xi. 11). The harvests were regarded as the gift of Yhwh, since they depended on rain coming at the proper time. Yhwh revealed His might by giving or withholding rain (Zech. x. 1; Job xxxvi. 27 et seq. ), which He caused to fall in some places and denied to others (Amos iv. 7). Abundant and seasonable rain is promised to the people as a reward for faithfully keeping the commandments (Lev. xxvi. 4; Deut. xi. 13 et seq., xxviii. 12; Jer. v. 24; Ezek. xxxiv. 26). Israel's sins, on the other hand, cause the course of nature to be disarranged (Jer. v. 25), and Yhwh punishes the people's iniquity by withholding rain (Deut. xi. 17, xxviii. 23 et seq.). The favor of the king is "as a cloud of the latter rain" (Prov. xvi. 15). The farmer longs especially for the "latter rain" (Job xxix. 23). Cant. ii. 11 et seq. describes the awakening of nature after the winter rains. See Palestine. The source of rain is in dispute in the Talmud. R. Eliezer held the opinion that all the world drank the water of the ocean, quoting, "There went up a mist from the earth, and watered the whole face of the ground" (Gen. ii. 6). "The clouds," he explained, "'sweeten' the salt water of the ocean." R. Joshua thought clouds are formed like bottles; they open their mouths to receive the water from the heights, and then they sprinkle the earth as through a sieve, with a hairbreadth space between the drops (Ta'an. 9b). 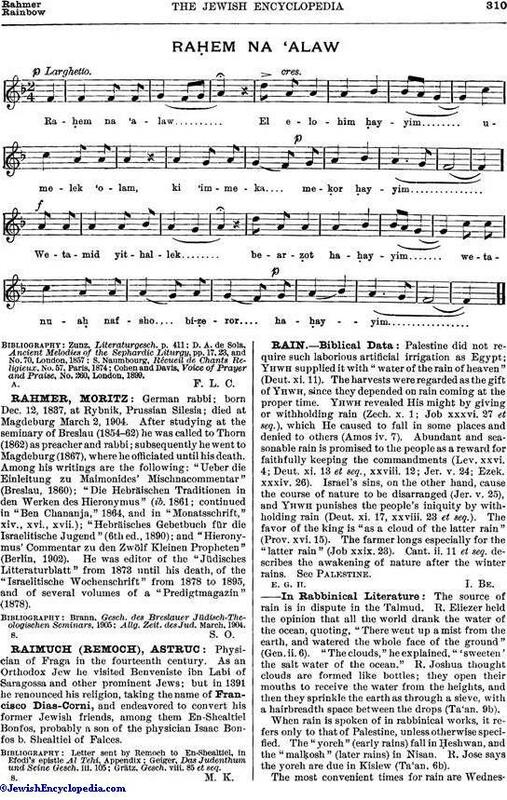 When rain is spoken of in rabbinical works, it refers only to that of Palestine, unless otherwise specified. The "yoreh" (early rains) fall in Ḥeshwan, and the "malḳosh" (later rains) in Nisan. R. Jose says the yoreh are due in Kislew (Ta'an. 6b). The most convenient times for rain are Wednesdaynight and Friday night, when the people remain at home. Rain on Friday disturbs shopping in preparation for Sabbath (Ta'an. 8b, 23a; Rashi ad loc.). On the last day of Sukkot the people observed the wind for indications of the following year's rain. The pilgrims in Jerusalem watched the drift of the smoke from the altar in the Temple: if it drifted toward the north, there would be plenty of rain; if toward the south, the rains would be scanty (Yoma 21b). R. Ḥisda said that after the destruction of the Temple the southern winds no longer brought rain (B. B. 25b). Scarcity of rain is attributed to the stoppage of the contributions of tithes, resulting in famine and loss of business. Tithe-giving causes the windows of heaven to open and the outpouring of the blessing of rain (Mal. iii. 10). R. Johanan said rainless heavens follow the people who fail to keep their promise to give alms, quoting, "Whoso boasteth himself of a false gift is like clouds and wind without rain" (Prov. xxv. 14; Ta'an. 7b, 8b). The heathen, in the event of a drought, sacrificed human life to appease the anger of their idol; their priest selected the victim indicated by a dream ('Ab. Zarah 5a). The Jewish remedy was prayer. The high priest on Yom Kippur prayed for healthful, rainy seasons (Yoma 53b). Shemini 'Aẓeret is the water's judgment day (R. H. i. 2), when Geshem (the rainprayer) is recited in the 'Amidah at Musaf, before the phrase "Mashshib ha-ruaḥ u-morid ha-gashem." It is interpolated in the benediction of the resurrection, inasmuch as rain revives the products of nature (Ber. v. 2, 33a). The insertion of "Ṭal umaṭar" in the ninth benediction of Shemoneh 'Esreh is known as the "request" or "solicitation" ("she'elah") for rain. In Palestine the she'elah prayer is first recited on the 7th of Tishri. R. Gamaliel set this date so that the pilgrims whose homes were in the cast might, on returning from Jerusalem, have fifteen days after Sukkot in which to reach the Euphrates (Ta'an. i. 3). Beyond Palestine the she'elah does not begin until the sixtieth day after the autumnal equinox (i.e., during the twentieth century on Dec. 5; Ta'an. 10a). Both interpolations are omitted from the first day of Passover till the next Shemini 'Aẓeret, as rain in summer causes injury to the harvest. In countries where rain is beneficial during the summer, the rain-prayer is inserted at the end of the sixteenth benediction (Shomea' Tefillah), including a country even as large as Spain or Germany (Shulḥan 'Aruk, Oraḥ Ḥayyim, 117, 2). The Jews who went to Brazil in the first half of the seventeenth century (probably 1642-46) found that the rainy season there occurred at a different time in the year; they therefore addressed a question to R. Ḥayyim Shabbethai of Salonica as to the necessity of changing the time of the rain-prayers from winter to summer to meet the conditions of the Brazilian climate. R. Ḥayyim decided that the rain-prayer might be omitted in winter and might be inserted at Shomea' Tefillah ("Torat Ḥayyim," iii., No. 3, Salonica, 1713-22). This is the first casuistic record of American Jewry. A series of fast-days follow if the rainy season is delayed. The fast-days are known as ("Sheni Ḥamishshi we-Sheni"; that is, Monday, Thursday, and Monday). If the rain fails to come by the 17th of Ḥeshwan the pious observe the three fast-days; if the rain has not come by the 1st for Kislew, the bet din decrees additional public fasts on the same day for three successive weeks. In case this remains ineffective, the bet din decrees another three-day fast, with all the regulations of the Yom Kippur fast-day, each beginning from the previous evening. If these do not avail, the bet din decrees seven more fast-days in which shofar-blowing takes place. The ceremony is conducted in the public square of the town, and the elder of the congregation preaches humiliation (Ta'an. i. 4-7, ii. 1). When rain falls on the fast-day, the day is ended by the recitation of full Hallel. The benediction for needed rain is, "We thank Thee, O Lord, for every drop of rain which Thou causest to descend upon us" (Ber. 59b). Ḥoni ha-Me'aggel was the most successful in praying for rain in the Second Temple period. But he would not pray against an excess of rain, saying, "I have a tradition not to pray against overabundance." Once, however, when the people urged him to pray for the cessation of rain which caused damage, he prayed: "O Master of the Universe! Thy people Israel, whom Thou hast delivered from Egypt, can bear neither too much good nor too much evil; they can stand neither Thy wrath nor Thy overabundant blessings. May it please Thee, O Lord, to stop the rain" (Ta'an. 23a). Shulḥan 'Aruk, Oraḥ Ḥayyim, 575-577. 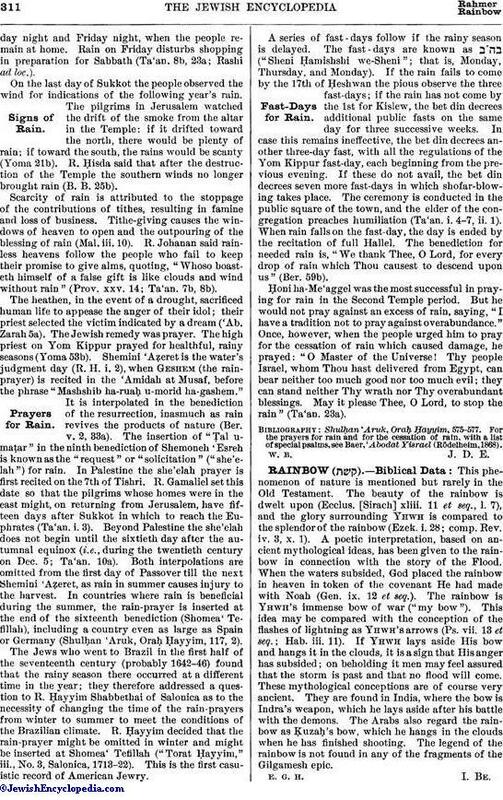 For the prayers for rain and for the cessation of rain, with a list of special psalms, see Baer, 'Abodat Yisrael (Rödelheim, 1868).